Berlin’s present Olympic Stadium is the second such building on the same site. Both were destined to be ill-fated. The original was intended as the venue for the 1916 Olympic Games. These games, of course, never took place. The second stadium was used for the 1936 games, an event with the dark shadow of Nazism hanging over it. The stadium has had a more agreeable existence since then, primarily as a football ground. Three matches were played here during the 1974 World Cup and six in 2006, including the final. 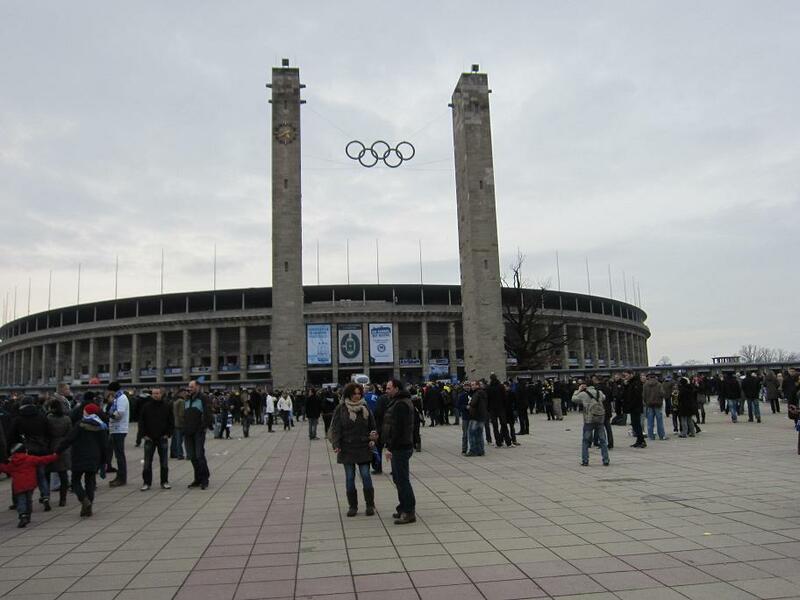 The Olympiastadion is also the venue for the German Cup Final and is due to host the 2015 Champions League final. 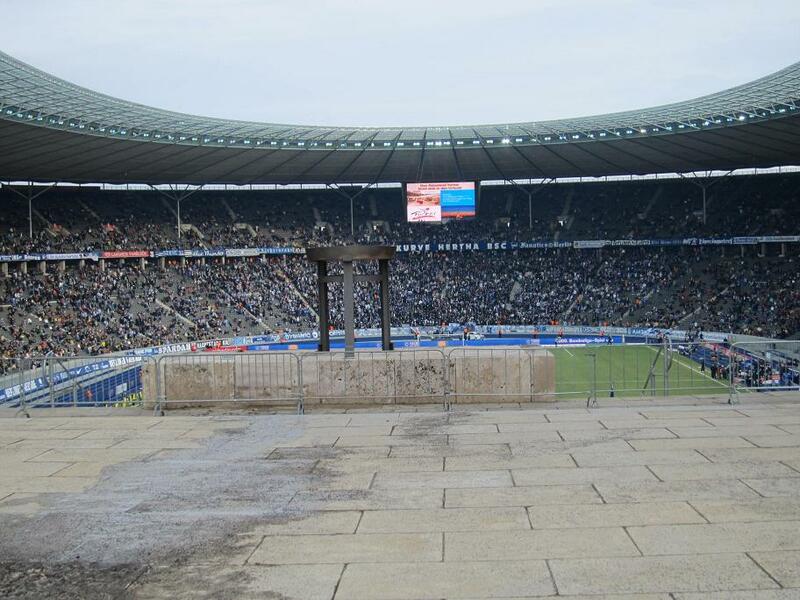 Hertha Berlin have occupied the stadium since the formation of the Bundesliga in 1963. The stadium was reconstructed in 2000 and feels impressively modern with its updated seating and giant roof. Walking round the exterior, however, provides a slightly unnerving experience, as there are still discernible features of the 1936 Olympic Games. 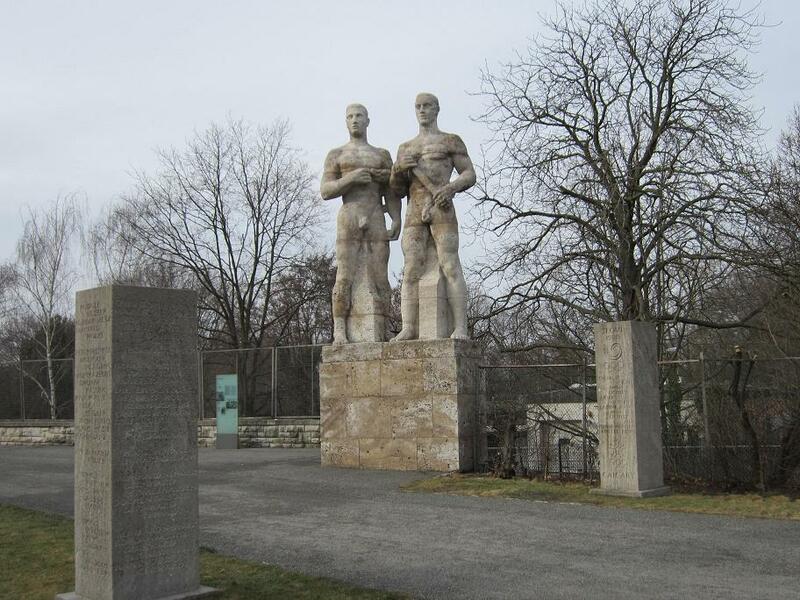 The neo-classical sculptures of muscular athletes are typical of the Nazi era – indeed, the stadium is reminiscent of the Colosseum in Rome, though it has a rather more spartan feel to it. 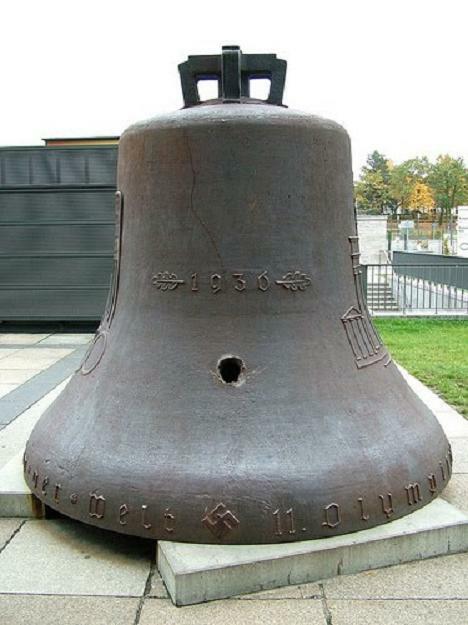 The Olympic Bell, complete with (partially eroded) swastikas, sits outside the stadium, separated from the tall tower that once housed it. The Olympic rings are plainly visible above the eastern gate at the stadium’s entrance. The stadium is part of a sports complex. The outdoor swimming and diving pool is located to the north of the stadium and there are several sports grounds dotted around the site. One of them, Maifeld, used for equestrian events during the 1936 games, is home to the Berlin Cricket Club, so those looking for something a bit different can say they have watched cricket in Berlin. The stadium can be visited at any time and guided tours are available, but is best appreciated when there is a match taking place. 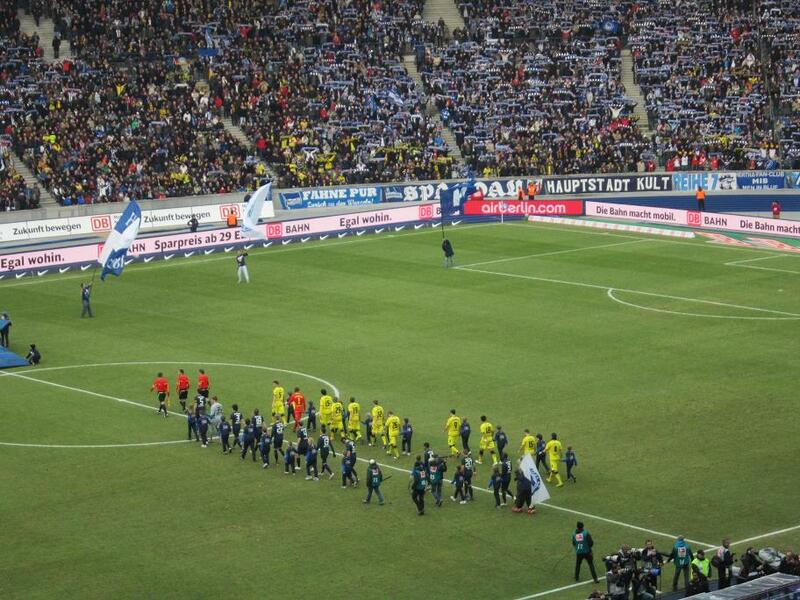 Even though the Bundesliga enjoys huge support, getting to a game is easy enough. 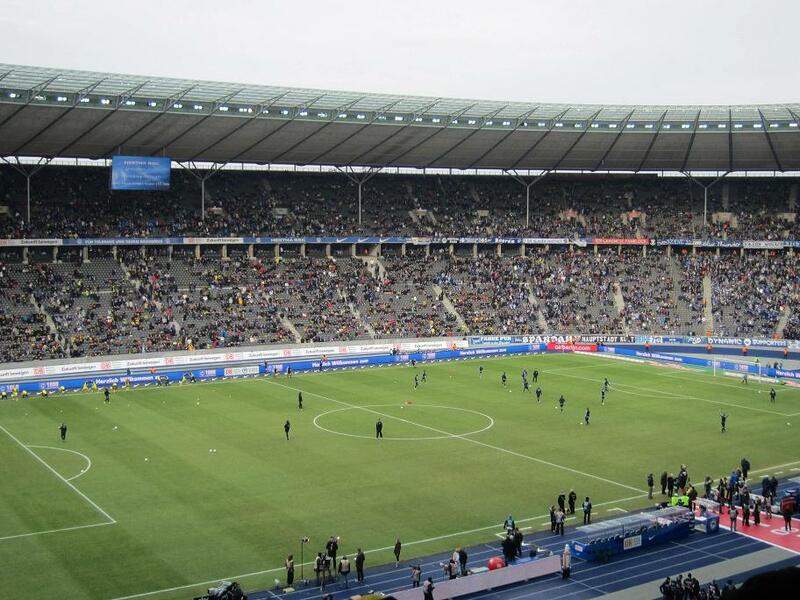 The capacity of the Olympiastadion is around 77,000, so it’s not too difficult to get a ticket for most matches. When Duck Holiday visited the stadium, the visitors were Borussia Dortmund, one of Germany’s best-supported clubs, but we were able to buy tickets at the ground about an hour before kick-off. Buying a ticket in advance is not a bad move, though. Germany has a rather more enlightened attitude towards football fans than some countries in Europe and if you are possession of a match ticket, it will cost you no extra to travel to the ground on public transport. Even if you haven’t got your match ticket, a Berlin Card will cover any transport within the city. There is a U-Bahn station (Olympia-Stadion) which is on the U2 (red) line and you can also get there by using overground trains (S-Bahn line S5). Those used to football in the UK may feel an element of surprise – though the surprise is pleasant – on arriving outside the ground. Beer stalls abound and fans of both clubs mingle and chat over jars of pre-match libations. This is indeed civilisation. Overall, there is an awful lot to be said for football in Germany. Ticket prices are far from exorbitant, there are no travel costs (other than the minor detail of getting to Germany), public transport is excellent, the stadiums are largely very impressive and the quality of the sport is high. Combining a visit to a museum in the morning with the footy in the afternoon and following that with a meal and a nice little variety of German beers in the evening makes for a thoroughly rewarding day. It might not amount to the cheapest day out you’ve ever had, but try doing something similar in, say, London and check the price difference. This entry was tagged Berlin, Football, Germany. Bookmark the permalink.